It’s been a very busy summer and we’ve so much to tell you about! Our Golden State “Warrior” long arm quilting machine is up and running like the newly facelifted machine that she is (okay, so Buff calls it a lobotomy…). We are moving through our backlog with speed and accuracy, finishing your beautiful quilts so that we can get them back into your hands. We thank you so much for your trust & patience during our down time. A special shout out to Barb, Cheri, and Sonja who kept us on schedule for all our deadlines with creativity and style! We want to thank all who participated and helped make our Shop Hop by the Bay 2018 in June a great success. We made the event quilt up in Tula Pink fabrics, and still have a few kits left. Row by Row, “Sew Musical” theme, is off to an exciting start. We enjoy having visitors from all over the country. We couldn’t decide on one, so we made TWO rows. as well as our Junior row, “MUSIC” Kit & pattern and “Quilt Crazy” license plates. Heather Fraser-Sharp is our 2018 Row by Row winner, and she took home 25 beautiful Kaffe Fassett fat quarters! Her joyful quilt was turned in and completed in less than 2 weeks from the start of the event! Congratulations Heather! Stop by the shop and see this creative quilt for yourself. We are calling this one Fishsticks!!! It will be made of beautiful ocean-colored batiks. What happens when you roll two pieces of 6 ½” x21” batik fabric together with a sheet of Half Square Triangle Exchange paper, take it home and sew them all together? You get 28 (2” when finished) HST’s! 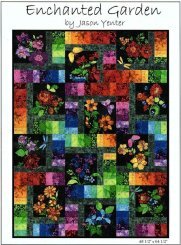 The more you sew and bring back to exchange, the more variety of HST’s you will receive, just perfect for the projects in Edyta’s Friendship Triangle book (available for purchase in the store) or any project that uses 2” finished half square triangles! Purchase cinnamon sticks at the store between 8/1 and 9/1/18 to make the required number of half-square triangles for your project. We have paired a dark/medium and light ocean-colored batiks with right sides together and layered HST paper on top, and rolled them up into a Fishstick! Pin the HST paper in place. Lower your stitch length (to make it easier to take off the paper later), and sew on the dotted lines. Cut the 28 HST’s apart on the solid lines, keeping track of your total number (baggies to the rescue!). Do not remove the paper from the HST’s until you have completed the exchange and start to sew your project. Bring your finished HST’s to the store from 9/1/18 to 9/15/18. We will collect all of them, mix them up, and give you back the number of HST’s you provided, beginning 9/16! 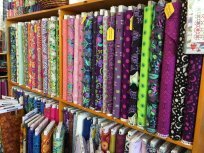 Alexander Henry fabrics, just perfect for Halloween or a Day of the Dead quilt, and a Ghastlies quilt kit you just have to see! Our Mid-Summer Sample Sale Starts TODAY - Just in time for the approaching holiday season. 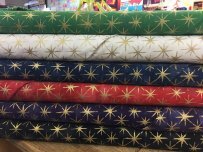 Start your quilt gift shopping early and get some bargains on some of our many quilt samples available for sale. Specially marked kits are on sale while supplies last. All Aboriginal fabrics are on sale for 30 %, including fat quarters. but the second session, Sept 15th-16th, still has openings. Sunday Brunch returns on September Sept.9th 11:00- 3:00 pm. Joy has made another beauty from the “Framworkz” pattern. One 2½ inch strip pack & addition yardage and pattern are required for this project. Please sign up at the shop. Perfect for all levels of quilting experience. Graphic Gems BOM continues with month six. It is not too late to join in, and we have a few kits available in both the Garnet & Sapphire and Lapis & Emerald colorways. Join Jane Rosenbush for her "Triangle Trails" class and create a beautiful modern quilt or table runner using Deb Tucker’s X-Block ruler. Class will be held on Sunday, August 26th from 12:00 – 4:00 p.m. Sign up at the Shop. Thursday, August 23rd 10:00 - 3:00pm and another class on Saturday, Oct 20th both from 10:00 - 3:00pm. This fun class will introduce you to the basics and modern EPP techniques. COMING SOON…Many of you have asked about another Tuffett class. We are finalizing the class date, so please stay tuned and check back soon. Pacific International Quilt Festival (PIQF) is right around the corner. Don’t forget mark your calendars Oct . 11th-14th. Check out the PIQF website (quiltfest.com) for classes and show information. Be sure to stop by our booth to say hello! 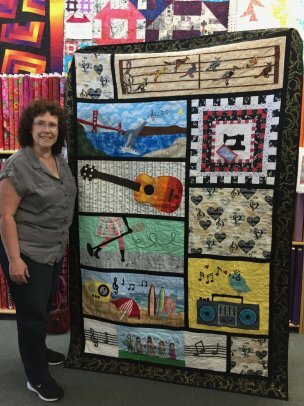 HELP WANTED: Golden State Quilting is looking for creative, experienced and energetic team members. Retail sales and quilting experience required. We are looking for shift coverage two to three days a week and one Saturday & Sunday per month.